Mononobe no Futo (物部　布都) is a shikaisen, formerly a hermit practicing Taoism. She possesses the ability to manipulate feng shui, and is from an old era of Japan. Futo first stands against the player in stage 5 of Ten Desires, as well as being a support parter for the stage 6 boss. She later became a playable character in Hopeless Masquerade, was a 9th Day Boss in Impossible Spell Card and appeared in Urban Legend in Limbo, again as a playable character. She is generally thought to be a shikaisen, meaning that she was once a hermit who attempted to surpass the physical lifespan of a human by taking on the qualities of the dead. She essentially abandoned her body and transferred her soul into an object (said to be a plate). As a shikaisen, she is able to take on a great number of forms, but she prefers the traditional look she had when she was alive, as opposed to Toyosatomimi no Miko's decision to go with a more modern form. 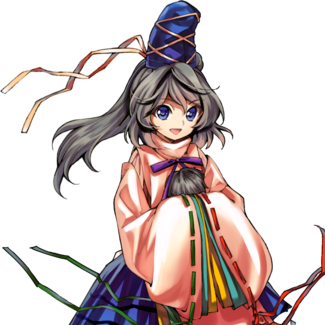 In her official profile, ZUN lists her as a "Taoist self-identifying as a shikaisen", but it can be inferred from her backstory as well as her article in Symposium of Post-mysticism that she is a bona-fide shikaisen. 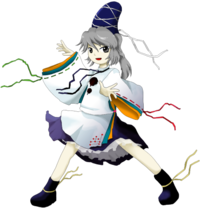 Futo is described as being gentle at heart, but unable to adapt to modern times along with modern Gensokyo in general. Hieda no Akyuu points out in Symposium of Post-mysticism that because of it, she has an extremely "hermit-like" personality. Even in ancient times, she clung to Taoism rather than Buddhism, indicating a dislike of change and a favoring of old ways. She is friendly towards humans, even going so far as to save them on occasion, but hostile towards youkai for some reason. Toyosatomimi no Miko describes her as being a scaredy-cat, though her "fear" of Buddhist statues led to her burning them (and temples) down to the ground (as the head of the Mononobe clan). In speech, she speaks with in an archaic Japanese language. In first person, she uses wa (我, archaic for "I") and in second person, onushi (おぬし, archaic for "you"). In her speech and conduct, she attaches zo (ぞ) to the end of her sentences for emphasis, which is a little old-fashioned. Based on this, it would be no problem to think that she was probably born a long time ago, and that she has a certain aura of nobility, never saying anything wild or off-beat. She says things which indicate that she might have a tendency to misunderstand others a little, for example she automatically thought that the heroine of Ten Desires have come to her for a blessing in order to recover. Thus she is a manifestation of the "idiot child", this may relate to how well she takes her defeat in general, sometimes praising the heroine. After battles, she always makes the excuse that she has not shown her true strength. Futo is apparently able to manipulate feng shui. This ability is mentioned in Symposium of Post-mysticism, where it is said that it's a power Futo aquired before studying Taoism, and that due to the similarities in terms of worshipping nature, it's something almost identical to Shinto. Feng shui is the flow of qi, particularly the flow of qi according to the environment. To manipulate feng shui is to apply some treatment to the surrounding environment and artificially change the flow of qi, and it is something that manipulates fate and fortune. Although it has a high effect on fixed things like towns and houses, its effect is thin on things that busily move, like people and animals. In terms of practical applications, Futo seems able to manipulate dragon veins to change the nearby ground, controlling fire, wind, and water, and even lowering the amount of fortune in a determinated area. 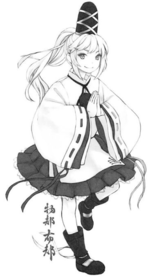 Futo currently serves Toyosatomimi no Miko and resides in the Hall of Dreams' Great Mausoleum while practicing Taoism. A plate is mentioned as the object Futo used to transfer her soul into in order to become a shikaisen, and she seems to carry several plates in Hopeless Masquerade. 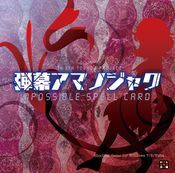 In addition, she is seen riding a boat during some of her spell cards in Ten Desires, Hopeless Masquerade and Impossible Spell Card. Futo originated in the Mononobe clan, widely known to be a Shinto-worshipping clan. However, she was actually a worshipper of Taoism. She decided to practice her Taoism in secret, as it lacked political power due to the fact that anyone can undergo the training required to become a hermit. Toyosatomimi no Miko eventually approached her and proposed a plan: Miko would pacify the nation under Buddhism, but she and Futo would die and be reborn as shikaisen. Futo agreed, and managed to ally herself with the Soga clan to get them to follow Buddhism blindly. After the Mononobe clan caught wind of this, a religious war ensued between them and the Soga clan. The Mononobe clan was eventually defeated after numerous harsh battles that left many Buddhist temples and artifacts destroyed; and thus the nation was united under Buddhism. Once the battles ended, Futo finally attempted the process of becoming a shikaisen by "dying". Miko soon followed suit, and they both ended up in Gensokyo. The Mononobe clan was a family who waged a fierce political battle with the Soga clan over Buddhism. In particular, Soga no Umako and Mononobe no Moriya were two very influential courtiers to Emperor Bidatsu and his brother, Emperor Youmei, who was the father of Prince Shoutoku. Both Youmei and Shoutoku were proponents of Buddhism, which led to victory for Umako, whose forces killed Moriya and his allies in the Battle of Shigisan in 587. Of the Mononobe, there existed Futsuhime (布都姫), who was the little sister of Mononobe no Moriya. In the Nihon Shoki, she was Soga no Umako's wife, although her name was never mentioned there. But according to the book, Umako "gratuitously killed Moriya by carrying out his wife's plot". So, according to this account, Futsuhime was a collaborator to Soga clan and a traitor to the Mononobe, despite her lineage. Furthermore, Umako and his wife are thought to have given birth to Tojiko no Iratsume, who as it turns out, is the possible basis of Soga no Tojiko. Other historical documents tell different accounts. For example, in the Sendai Kuji Hongi, she was married to Emperor Sushun and later to Mononobe no Nieko no Muraji, who was Mononobe no Moriya's little brother and Futsuhime's half brother. Her full name is Mononobe no Futo (物部　布都). She takes the name Mononobe (物部) as a member of the Mononobe clan. Her given name, Futo (布都, lit. "cloth city/capital/metropolis"), is derived from the name Futsuhime (布都姫), whom her name was based off on. 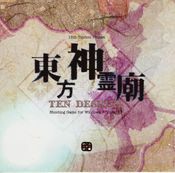 In Ten Desires's official art, Mononobe no Futo has grey eyes, grey hair and is dressed in a uniform which resembles Heian Era clothing such as a kariginu (狩衣, lit. "hunting dress") or a suikan (水干, lit. "dried with water"), modified with the addition of a purple skirt, with an eboshi (烏帽子) atop her head. Kariginu or suikan were worn for everyday clothes by the male Kuge (公家, "people of the Imperial Court") in the Heian Era. 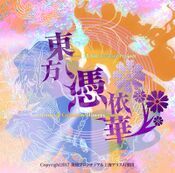 When the heroine reaches the Hall of Dreams' Great Mausoleum in stage 5, Futo appears to them, having been reborn as a shikaisen. She challenges the heroine, thinking that she is the final trial to be overcome in her resurrection. After she is defeated, however, she realizes that the spirits of desire are actually flooding into the mausoleum in anticipation of Toyosatomimi no Miko's resurrection rather than her own. Futo initially approaches the Hakurei Shrine after Miko defeated Reimu Hakurei in combat, and she wants an explanation. However, Reimu has shut herself in, and Futo ends up battling Marisa Kirisame first. After emerging victorious, she approaches Koishi Komeiji for the same reason. She then travels to the Myouren Temple, where she reveals her goal to Ichirin Kumoi - that their respective religions unite for the common good of the suffering people. Ichirin insists that Byakuren Hijiri has it under control, and that they need no help from the likes of a taoist. After Futo defeats her, she is impressed and invites her to convert; Ichirin refuses, prompting Futo to mention the fact that she drinks alcohol. Futo then wanders to the Youkai Mountain, having realized that Miko already resolved the incident. There, she runs into Nitori Kawashiro, who is taking down her stall. Futo inquires as to the details of Nitori's battle with Miko, but Nitori couldn't care less about the religious war. This prompts her to attempt to convert Nitori, but after she defeats the kappa, Nitori decides that if she were to become a religious believer, she'd probably go to Shinto rather than Taoism, much to Futo's dismay. As Futo returns to the Human Village, she encounters Miko herself, and they engage in battle. However, it was actually Mamizou Futatsuiwa in disguise, and after Futo loses all her popularity in the process of defeating her, she battles Mamizou in her true form. After defeating her again, Mamizou explains that she was only looking out for the humans, and that someone is behind all this. Futo encounters Hata no Kokoro that night, who is trying to figure out what to do with her time until Miko creates a new Mask of Hope for her. Unfortunately, the two end up fighting each other. After defeating her, Futo returns to the Mausoleum, where Miko explains that she's making a new mask. Futo is doubtful. 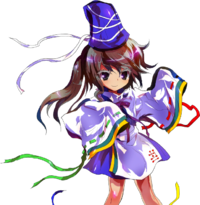 Futo has been Toyosatomimi no Miko's faithful servant since before the religious war between Shinto and Buddhism. After they died to become shikaisen together and reappeared in Gensokyo, they remain together. Symposium of Post-mysticism says that they usually act in unison. Their official profiles state that Futo and Soga no Tojiko get along with each other for the most part, despite their origins as enemies in the religious war. They seem to be united under the fact that they both hate Buddhism. However, in Symposium of Post-mysticism, it's revealed that the reason Soga is a ghost is because Futo tricked her when they became shikaisen, having held a grudge against her during the religious wars. Soga, however, does not seem to have a problem with being a ghost, so it's possible they are still on good terms. Due to her automatically misunderstanding others, she quickly came to conclusions the first time she met Reimu, Marisa, Sanae and Youmu. For instance: with Reimu, she thought that she has come to be an experimental subject for complete recovery; with Sanae, she thinks Sanae has come to deliver her to heaven; and with Youmu, she thought she was a shikaisen (dead nirvana hermit), and therefore continues to think Youmu is a hermit even after the battle. Her clothing – a kariginu-like outfit with the upper part in white – resembles typical Heian Era clothing, or a stereotypical onmyouji uniform in Japanese pop culture. SinGyoku's "male" form wears similar clothing. While not canonically stated, if Futo is Futsuhime then she would be one of a few characters known to have been married (the others being Seiga Kaku, Watatsuki no Toyohime, Watatsuki no Yorihime, and Junko). 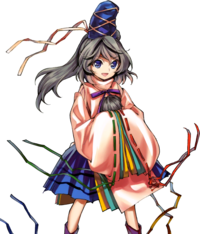 Due to localization of the fangames that are part of Play, Doujin!, she is internationally known as Futo Mononobe. In some articles in gaming sites about the Touhou Genso Wanderer fangame, Futo's name was misspelled as Ruto. Long ago, indeed, fourteen hundred years ago or so. Before, in fact, it had been decided that the country would rule over the people. People, things, technology, religion... Many things were being introduced from across the sea. One of those would greatly influence the direction Buddhism would take in this country. The country was divided into pro- and anti-Buddhist factions, which dug in more over time. The Mononobe, the ones who had Umashimaji no Mikoto - a god in Shinto - as its ancestor, was in the anti-Buddhist faction. Her confrontation with the Soga, the ones who had a human as its ancestor, was dreadful, and afterwards this religious conflict wasn't talked of as a petty political battle, but as a battle between the lineage of the gods and human dignity. And so, religious war over Buddhism ended in tragedy. The battles grew more vicious with each passing day as the Mononobe waged an anti-Buddhist campaign that invaded and burned temples and threw out their statues. Perhaps it was simply bad timing, but after that day, an epidemic began to spread, resulting in the passing of the Emperor. The Soga proclaimed this to be a curse brought on by despicable acts against Buddhism. This rallied support in Soga's favor, who was eventually given permission to bring the Mononobe into submission. This battle resulted in the destruction of the Mononobe. From then on, the nation's politics were carried out in a fashion befitting Buddhism. This is what most people know about the religious war between the Mononobe and the Soga. However, there was someone else pulling the strings behind the scenes: Futo. A daughter of the Mononobe, she worshipped at the altar of another faith. That faith was Taoism, which had been introduced at the same time as Buddhism. Taoism could grant people superhuman abilities based on their own actions, eventually resulting in immortality. It was particularly appealing to those with political power. However, that appealing faith also had a weakness. It was not well suited for political control, as anyone could undergo the ascetic training necessary to become a hermit. As a result, she decided to practice her Taoism in secret. Miko, a fellow Taoist practitioner, came to her with a certain plan. Her plan was to govern the country using Buddhism as a means to keep the citizenry pacified. Then, they would cast a curse on their own deaths and be reborn as shikaisen. Futo became an ally of the Soga and was able to manipulate them. Thus, the Soga came to be blind followers of Buddhism. Naturally, as descendents of the gods, the Mononobe (excepted Futo) weren't particularly pleased about this. The result was a protracted religious war over Buddhism. It was, in fact, a war between ancient gods of Japan in name of the Mononobe and Miko, who wished to become a new god through Taoism. Thus Buddhism was only a deception for their plan. However, it seemed it would take a long time for their resurrection to take place. That was probably because a group of Buddhist monks doubted that Miko had actually died, and constructed a large temple above her grave to prevent her from resurrecting. Buddhism had been used for political ends, but it had apparently been a miscalculation to allow it to become so widely followed that even in modern Japan it continues to be widely observed. Believing that those with violent hearts must be saved, Miko began to move. she tells them to re-make their momentary lives. To do that, she must fight against other religionists. Futo decided to use that support. she attains more power as a hermit. When her hermit power is fulfilled, various attacks get powered up. so the longer the fight goes on, the more advantageous of a situation it becomes for her. Futo releases flames everywhere around her, and makes the field into a sea of fire. and if the opponent draws near, their physical strength will fall. The closer to the sea of fire they get, the more their physical strength falls. Occult Name "Bancho Dish Mansion"
With Danmaku that utilizes plates, and now with a special finishing move that installs plates on the screen, Futo is a technical character. Seeing as positioning is the lifeblood of Feng Shui, Futo's own footwork is absolutely of the fastest kind. Her Occult Attack “Okiku Upper” gets stronger the higher the number of plates broken, and at 9 plates it will show its true power. Before I even knew it, I found myself here." An old-fashioned Taoist hermit who can manipulate feng shui. At the behest of her master, who is investigating the Perfect Possession incident, she searches for the incident's driving principle. A speed character who fights with her special attacks, which make use of the plates she sets up, and her agile maneuverability. 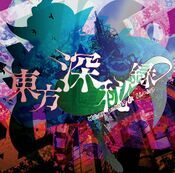 ↑ Hopeless Masquerade - Mononobe no Futo's Spell Cards: Fate "Gate Opening for Catastrophe"
↑ Academically, the ancestor is thought to be Takenouchi no Sukune (武内宿禰).